Instead of loyalty to constitutional principles or the law, Comey was revealed to be loyal only to his own outsized sense of entitlement to hold on to power. At the end of a day that was supposed to be full of high drama, what the world saw was a little man who did nothing but feel “queasy” when Obama’s Attorney General Lorretta Lynch directed him to align his language about the Clinton email investigation with that of the Hillary Clinton for President campaign. In answer to Senator Rubio, James Comey was certainly right, no one will mistake him for one of the heroes of Rudyard Kipling’s novel, Capt. Disko Troop or Manuel Fidello, hard-bitten working men who rescued a young boy lost at sea and taught him about honesty, integrity, hard work and being a man. However, Comey had the “presence of mind” to lie to his Boss, the President by saying, “I’ll see what I can do” and then writing himself a CYA memo. 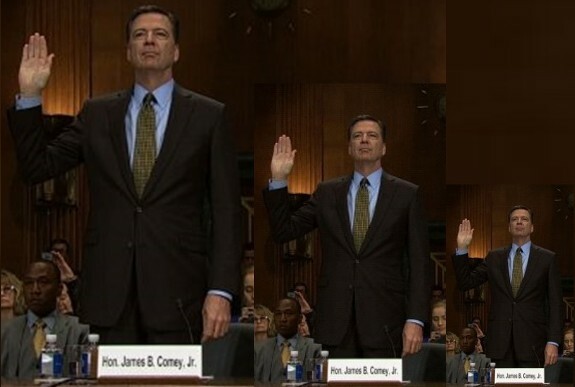 And just when we thought James Comey couldn’t get any smaller, he revealed himself to be a coward who engaged in a petty attempt to get back at the President who fired him by leaking memos he purportedly wrote to document his conversations with the President who canned him. If there was anything in yesterday’s testimony that confirmed the character – or lack thereof – of James Comey it was his tortured explanation of why he leaked, rather than called a news conference to stand-up for himself. What James Comey said was that he was afraid. That’s right, the tough G-man, the last honest man in Washington, who compared himself to the martyred Saint Thomas a Beckett, was afraid. Unlike the martyred Saint Thomas, who stood-up to a king, James Comey admitted he was just a simple coward. Indeed, if there was a thread that ran through James Comey’s testimony before the Senate Intelligence Committee it was that of his personal and professional cowardice. And Comey admitted as much to Democratic Senator Diane Feinstein of California. When Senator Feinstein pressed Comey about his account of a March 30 phone call with President Trump in which Comey alleged that the President asked him "to find a way to get out" that Trump wasn't personally under investigation. "I told him I would see what we could do," Comey testified. "It was kind of a cowardly way of trying to avoid telling him, we're not going to do that," he admitted to Feinstein. "It was a way of kind of getting off the phone, frankly." So, Comey was too cowardly to tell Loretta Lynch “no” when she demanded he align his communications with that of the Clinton campaign. Too cowardly to tell President Trump he couldn’t talk to him about the Michael Flynn investigation. Too cowardly to hold his own press conference about his memos allegedly memorializing his conversations with President Trump. And too cowardly to tell the President he couldn’t or wouldn’t put the word out that Trump was not personally under investigation regarding the allegations of Russian involvement in the 2016 election. Perhaps if James Comey had known his Rudyard Kipling a bit better he might have chosen a different metaphor for himself than Captains Courageous, the one where Kipling said, Now, don't be angry after you've been afraid. That's the worst kind of cowardice. Kipling knew his cowards well, and James Comey’s anger after the fear of losing his power is indeed the worst kind of cowardice. Submitted by email_registrat... on Sat, 06/10/2017 - 07:27. Submitted by email_registrat... on Fri, 06/09/2017 - 12:24. I still don't understand why the President didn't fire him on day one. Anyone associated with the corrupt Obama administration should have been gone right from the start . No wonder there are so many leaks.